Manchester United fans took to Twitter last night to hail on-loan defender Timothy Fosu-Mensah as a ‘United legend’ for injuring Man City’s Kevin De Bruyne in Fulham’s clash with Pep Guardiola’s side in the League Cup. The Whites, who have started this season very poorly on all fronts, lost 2-0 to City in a one-sided affair at the Etihad, however it was one moment in particular that had United fans licking their lips ahead of next week’s Manchester Derby. In the second half, Fosu-Mensah challenged De Bruyne for a loose ball in Fulham’s half, with the outcome seemingly injuring the Belgian, something that saw him hauled off by Guardiola. As per the Sun, former Barcelona boss Guardiola noted that De Bruyne was “checked” by the club’s medical staff after being subbed off on Thursday night, and the club are hoping that this new injury scare isn’t a serious one. Because of this injury, it may be that De Bruyne ends up missing the first Manchester Derby of the season next week, something United fans were very quick to pick up on. After the match, Red Devils supporters flocked to Twitter to hail Fosu-Mensah for potentially giving the cluba big boost ahead of their massive clash against their local rivals next week. 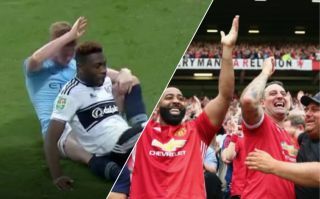 Here are a few tweets from United fans praising Fosu-Mensah for his actions last night.